Cross Canada Tours x 2. Learn more about Tour Arctic. 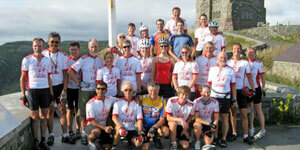 Tour du Canada is a cross-Canada club event. Participants are members of the club and participate in the club and event on a shared cost basis. It is an annual event first held in 1988. 59 riding days, total distance by bike 7,640 km (4,645 miles), daily average 129 km ( 80 mi.). Learn more about Tour du Canada. Leisurely Tours with average daily distances of 45 km to 81 km (28 mi. to 50 mi. )Terrain is not hilly. Vacation Tours 84 km to 110 km (52 mi. to 8 mi.). Mostly gentle to rolling terrain, some trips have 1 or 2 days of climbing. .
Expedition Tours with average daily distances of 100 km to 117 km (62 mi. to 72 mi.). Terrain can be hilly and very challenging, sometimes in remote areas. Cross Canada Tours. West-east average daily distances of 127km (79mi. ); to high north 97 km (60 mi.). Terrain can be hilly and very challenging, sometimes in remote areas. On all tours there is a motor vehicle that carries rider gear and group equipment.